For some time, my colleague Tim Winship and I have been warning about future tightening of frequent-flyer programs. Specifically, we’ve noted that airlines would like to tie benefits more to what you pay for your ticket than how many miles you log. Delta seems to be spearheading the effort, and although no big competitor has followed yet, you can expect “me, too” responses fairly quickly. Delta’s latest move is to tighten qualifications for elite status. Now, in addition to just miles, you have to meet spending thresholds for coveted elite status: Starting in 2025, first-level silver status will require $2,500 in spending annually, along with the previous 25,000 miles or 30 segments of actual flying; gold will require $5,000 in spending/50,000 miles/60 segments; platinum will require $7,500 in spending/75,000 miles/100 segments; diamond will require $12,500 in spending/125,000 miles/140 segments. Delta will waive the dollar requirement if you charge $25,000 a year to a Delta credit card. For very-frequent flyers, elite status has become the main benefit, not just the miles. Elite status on a giant airline brings some mix of “free” domestic upgrades, improved economy seating, preferred boarding, lower or no baggage fees, and such. The upgrades, in particular, are the holy grail, and the higher your status, the easier you get them. 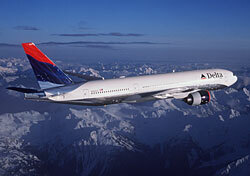 Previously, Delta lowered the mileage-earning rate on a few little-used special low fares. You can expect more of that, too, but not a lot. Big airline frequent-flyer programs have become cash cows, as airlines sell billions of dollars worth of miles to credit card companies and others to give out to their customers. And carriers can easily cope with the huge numbers of miles by limiting award seats. I expect more tightening of elite programs going forward. New American Logo: Like or Dislike?